These models and the statistics behind are best documented in the study of human activity patterns, and include burstiness, long-range cross-correlation and auto-correlation, and strong non-Gaussanity. We have mostly focussed on those aspects valid for the study of financial markets time series although we also recently also analyzed aspects with crutial interest in the economics of climate change. During the last decade, the group has focused on a number of major challenges in this area including the alignment between theoretical and empirical analysis of extreme events, data driven probability inference in time-series and direct parameter estimation in agent-based modelling. We have solved and analyzed a large class of stochastic models. Some of them are defined in terms of a Langevin equation or a stochastic differential equation and, in some cases, we also treat multidimensional and coupled diffusion processes. Another approach we have explored is by means of the so-called Continuous Time Rando Walk framework. We review the level-crossing problem which includes the first-passage and escape problems as well as the theory of extreme values (the maximum, the minimum, the maximum absolute value and the range or span). We set the definitions and general results and apply them to one-dimensional diffusion processes with explicit results for the Brownian motion and the Ornstein-Uhlenbeck (OU) process. In this paper we focus our attention on a particle that follows a unidirectional quantum walk, an alternative version of the currently widespread discrete-time quantum walk on a line. Here the walker at each time step can either remain in place or move in a fixed direction, e.g., rightward or upward. While both formulations are essentially equivalent, the present approach leads us to consider discrete Fourier transforms, which eventually results in obtaining explicit expressions for the wave functions in terms of finite sums and allows the use of efficient algorithms based on the fast Fourier transform. The wave functions here obtained govern the probability of finding the particle at any given location but determine as well the exit-time probability of the walker from a fixed interval, which is also analyzed. The Feller process is an one-dimensional diffusion process with linear drift and state-dependent diffusion coefficient vanishing at the origin. The process is positive definite and it is this property along with its linear character that have made Feller process a convenient candidate for the modeling of a number of phenomena ranging from single-neuron firing to volatility of financial assets. While general properties of the process have long been well known, less known are properties related to level crossing such as the first-passage and the escape problems. In this work we thoroughly address these questions. Volatility measures the amplitude of price fluctuations. Despite it being one of the most important quantities in finance, volatility is not directly observable. Here we apply a maximum likelihood method which assumes that price and volatility follow a two-dimensional diffusion process where volatility is the stochastic diffusion coefficient of the log-price dynamics. We apply this method to the simplest versions of the expOU, the OU and the Heston stochastic volatility models and we study their performance in terms of the log-price probability, the volatility probability, and its Mean First-Passage Time. The approach has some predictive power on the future returns amplitude by only knowing the current volatility. 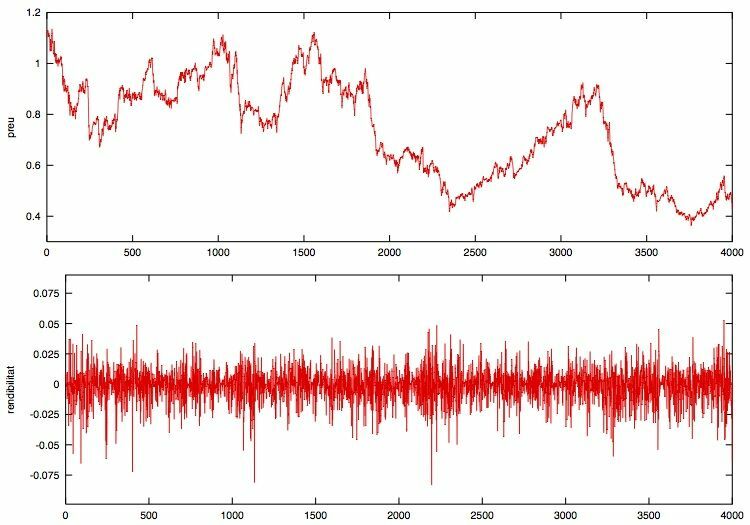 The assumed models do not consider long-range volatility autocorrelation and the asymmetric return-volatility cross-correlation but the method still yields very naturally these two important stylized facts. We apply the method to different market indices and with a good performance in all cases. Financial markets provide an ideal frame for the study of crossing or first-passage time events of non-Gaussian correlated dynamics, mainly because large data sets are available. Tick-by-tick data of six futures markets are herein considered, resulting in fat-tailed first-passage time probabilities. The scaling of the return with its standard deviation collapses the probabilities of all markets examined-and also for different time horizons-into single curves, suggesting that first-passage statistics is market independent (at least for high-frequency data). On the other hand, a very closely related quantity, the survival probability, shows, away from the center and tails of the distribution, a hyperbolic t(-1/2) decay typical of a Markovian dynamics, albeit the existence of memory in markets. Modifications of the Weibull and Student distributions are good candidates for the phenomenological description of first-passage time properties under certain regimes. The scaling strategies shown may be useful for risk control and algorithmic trading. The continuous-time random walk (CTRW) formalism can be adapted to encompass stochastic processes with memory. In this paper we will show how the random combination of two different unbiased CTRWs can give rise to a process with clear drift, if one of them is a CTRW with memory. If one identifies the other one as noise, the effect can be thought of as a kind of stochastic resonance. The ultimate origin of this phenomenon is the same as that of the Parrondo paradox in game theory.